Northern House School (Wokingham) Special Academy supports the learning of pupils with Social Emotional and Mental Health difficulties. Sleuth Project Lead Sarah Concannon explains why and how they are using Sleuth to support pupils and staff. “Before we introduced Sleuth, we were using SIMs to record all minor behaviours and using a paper based form to record physical interventions. The original intention was for it all to be on SIMs but due to tediousness of adding information to SIMs this didn’t always happen. Analysis of behaviour was only done half termly for the negative behaviours. “We introduced Sleuth to improve this process and give us visual information that’s easier to interpret at the click of a button. We now have all the positive, negative and PI information data in one place and it’s much easier to record and quickly enter data. We’ve been able to adapt Sleuth to the school’s needs to record what we want. to use the data gathered to interpret students behaviours (good and bad) and where necessary recognise patterns and put in the necessary support/intervention to help the student achieve their goals. to empower staff to use information about their students in supporting their planning and help their students with purposeful target setting. to provide leaders with a measure of improvement in behaviours on a weekly and half termly basis. “Staff quickly realised how powerful Sleuth and the data it captures really is in supporting the development of the students we work with. “One immediate benefit of Sleuth was using it with students to reflect on how their week has gone and to discuss their targets for the coming week. Tutors now have a single point to access information through Sleuth so they use it on a daily basis to review how their tutees are doing, keeping them completely informed on events that have happened. “We use Sleuth for our positive recognition called Buzz Points. These are awarded each lesson for being safe, sensible, respectful, in the right place and focused on learning. 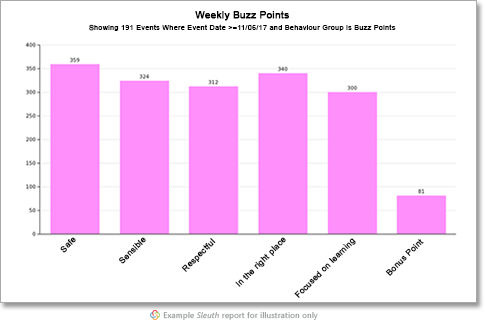 We have a suite of reports to calculate and display Buzz Points and we use these to reward progress and success. “In terms of our whole school approach to behaviour, teachers are better informed and aware of the behaviours and students involved so conversations with students that used to happen the following day, to praise or reprimand, are more often than not happening on the same day, having a greater impact on the student.